(c) devise a strategy that addresses National’s chronic lack of a viable coalition partner. As Bill English proved, there’s no point in winning the biggest share of the vote if you can’t form a government. For all of ‘good old Bill’s’ alleged virtues – and it would be naive to think he got as far as he did by being a nice guy – that 2017 outcome will remain the biggest blot on his political career. Essentially, English ran a great FPP campaign last year, and if the political system hadn’t changed 25 years ago you’d have to count that performance as a success, after three terms in government. After three terms in government though, you’d also have to think that the need for a partner should have been blazingly apparent. Yet like most things that landed in its ‘too hard’ basket, the Key/English administration all too typically ignored the problem, in the hope it would go away, with a bit of token attention if and when the time came. It will now fall to English’s successor to lead National successfully in a MMP climate that requires the cultivation of viable partners. It needs to make overtures to New Zealand First, or gamble that NZF will be so discredited come 2020, it won’t make 5% next time around, especially if Winston Peters isn’t any longer at the helm. That’s a key point. Come 2020, will National’s new leader be dealing with Peters, or with Shane Jones? Life could be a lot easier for National’s new leader if he/she were to be dealing with Jones. Plus, if NZF is still polling in the basement by 2020, Jones will be casting around for a scapegoat – the Greens! – to justify him jumping ship, and taking his regional development role over to the party of the rural electorates. So… the passage of time may well help National to resolve the third item on the list above. Clearly, if National simply wanted an attack dog able to run an effectively negative, carpet bombing assault on the credibility of the current government it would be looking to Judith Collins, which on (b) above, would also mean veering much further to the right, on both social and economic policy. Some kind of policy shift faces who-ever gets the top job. If it is decided that the Key/English period was too wishy washy and moderate on matters dear to the centre-right – and some within the party and the business community definitely think that was the case – then what’s to be the alternative policy posture? Can National get away with you simply pouring its old wine into a (not so) new bottle ? Not really. Surely, it wouldn’t be good enough for National to get in behind a ‘back to the future’ policy package that pushed all of its old buttons – ie. promises of tax cuts, and a more punitive, cost cutting approach to social spending – and then hope for the best that Judith or Simon or Steven can tart it up sufficiently to get by? To repeat: there are plenty among the rank and file who would welcome someone at the top who clearly and fearlessly expressed the centre-right’s old time religion. That’s Collins (only) hope. Trouble is, the time has passed for that approach, out among the wider electorate. One reason why Jacinda Ardern is popular is that she seems willing to address social problems that the Key/English regime ignored, denied, or relied on trickle-down economics to fix. What National took into the 2017 election was the last hurrah for a policy agenda that had been running on fumes since 2011, at least. Keeping on down that track would risk making National look entirely irrelevant, come 2020. For that reason, National cannot afford to choose the best leader for fighting yesterday’s battles. Among other things, that approach (the Collins nuclear option) would further alienate New Zealand First, with whom the new leader should try to build bridges at some level, even while striving to discredit them in Parliament. The galloping likelihood of an extended spell on the opposition benches should have implications for National, once Bill English [has] departed the building, around mid 2018 at the latest. Could National really afford to expend its best long term leadership prospect – the Simon Bridges/Amy Adams combo – by sending it off to almost certain defeat in 2020? Arguably therefore, an interim solution was called for. Someone confident enough to lead the troops over the top, straight into the wire and the machine guns. When Pope John Paul II died, the papal conclave had been blessed with all sorts of enticing change contenders – yet it also had one looming holdover from the previous papacy, in the shape of Cardinal Ratzinger, the deadly Mr Fixit for John Paul II. In the end, the conclave limply handed Ratzinger the top job, mainly because otherwise, he would have cast such a baleful shadow over anyone else they picked. This was all on the understanding that even while Ratzinger (aka Benedict XV) plainly didn’t have the human skills necessary for papal success, it would be just an interim solution. In other words, let the worst option rule the roost during impossible times, to get rid of him/her. 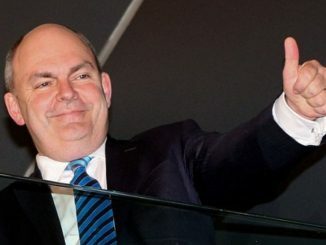 By the same infallible logic… either Steven Joyce or Judith Collins could be the kamikaze interim leader usefully expendable at election 2020, once Bill English had done the decent thing. They’d give it a good go. Then National would be free to pick Simon and Amy. Good. Very, very good. Steven wouldn’t even see the machine guns until it was too late.